ONLY 2 COPIES LEFT! 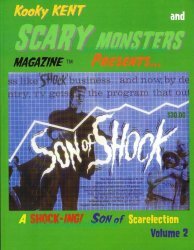 "Kooky Kent" and Scary Monsters Magazine Presents Son of Shock Volume 2, highlighting the second package of films distributed to TV stations in 1958. The first was Shock!/Shock Theater distributed the year before. Following are the films that comprised the Son of Shock film package sold to TV stations across the U.S. in 1958. This package contained 20 films from Universal and Columbia Pictures. The original Shock! package contained 52 films. These movies are not included with this item. The magazine contains articles about some of them. Special reprinted pages from vintage mags Monster Parade, Mad Monsters and Horror Monsters are included. Perfect-bound, glossy soft-cover book. Color cover and 100 B&W inside pages. Published in 2009.